I take no pleasure in highlighting another Rules breach by the 14-year-old Chinese golfing sensation, Guan TianLang. You may remember that he became one of the very few players to have ever been penalised for slow play in a major tour event when the penalty was imposed on him under Rule 6-7 at the Masters last April. He had received two separate warnings about his slow play from European Tour chief referee John Paramor, on his 12th and 16th holes, before being penalised one stroke on the 17th, after he had exceeded the US PGA Tour 40- seconds time limit for a stroke by a ‘considerable margin’. According to eyewitnesses, Bowditch confronted the teenager about his lack of knowledge of the Rule and at the end of the round reportedly refused to sign his score card, although he did eventually consent to do so once the penalty was imposed by the officials. Bowditch’s irritation may have reflected the critical view held by several tournament Pros that the 14-year-old amateur golfer is repeatedly taking the place of tour professionals who need the starts. 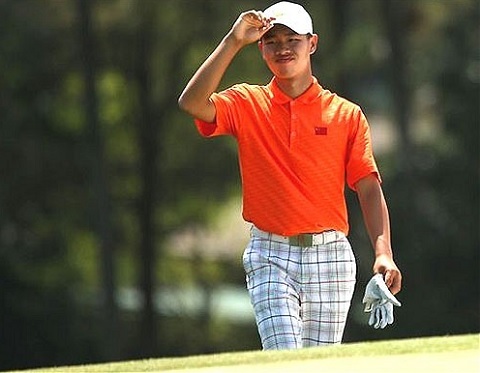 Guan’s lack of Rules knowledge was not a significant issue on this occasion, as he missed the weekend cut by 4 strokes, but one hopes that his two brushes with the Rules in less than two months will have taught him an important lesson for his promising golfing future. A more entertaining incident occurred during the same FedEx St. Jude Classic when a duck moved Robert Karlsson’s ball on the 11th green. We can view what happened thanks to PGATour.com. Readers receiving this blog by email can view the video by clicking here. Have you purchased a copy of my eDocument, '99 Tips on Using the Rules of Golf to Your Advantage'? Click here for details. I thought you could not be penalised for playing the wrong ball from a hazard so he had no need to identify it away?? No, you are wrong. That Rule was changed in January 2008. To summarise the change; Rule 12-2: Players are permitted to lift a ball in a bunker or a water hazard to identify it, with a corresponding change to Rule 15-3 removing the exemption from penalty for playing a wrong ball in a hazard. Disqualified for Wearing the Wrong Spikes!